Capital of the government of the same name in Russia, situated on the left bank of the Volga, about sixty miles from the Caspian sea. It is generally supposed to have been built near the site of Atel (or Itil), the ancient capital of the Chazars. 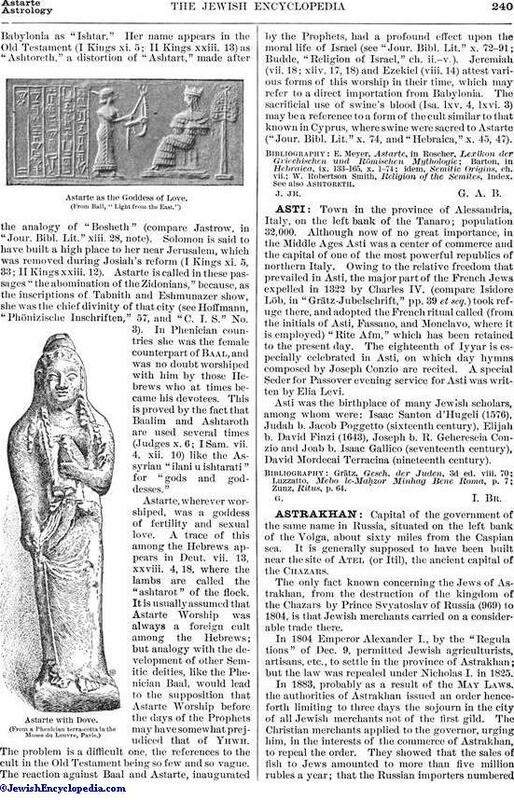 The only fact known concerning the Jews of Astrakhan, from the destruction of the kingdom of the Chazars by Prince Svyatoslav of Russia (969) to 1804, is that Jewish merchants carried on a considerable trade there. In 1804 Emperor Alexander I., by the "Regula tions" of Dec. 9, permitted Jewish agriculturists, artisans, etc., to settle in the province of Astrakhan; but the law was repealed under Nicholas I. in 1825. 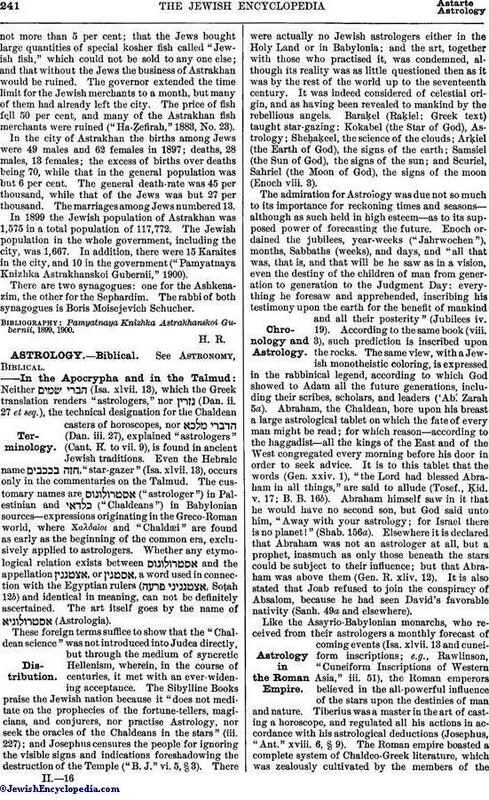 In 1883, probably as a result of the May Laws, the authorities of Astrakhan issued an order henceforth limiting to three days the sojourn in the city of all Jewish merchants not of the first gild. The Christian merchants applied to the governor, urging him, in the interests of the commerce of Astrakhan, to repeal the order. They showed that the sales of fish to Jews amounted to more than five million rubles a year; that the Russian importers numberednot more than 5 per cent; that the Jews bought large quantities of special kosher fish called "Jewish fish," which could not be sold to any one else; and that without the Jews the business of Astrakhan would be ruined. The governor extended the time limit for the Jewish merchants to a month, but many of them had already left the city. The price of fish fell 50 per cent, and many of the Astrakhan fish merchants were ruined ("Ha-Ẓefirah," 1883, No. 23). In the city of Astrakhan the births among Jews were 49 males and 62 females in 1897; deaths, 28 males, 13 females; the excess of births over deaths being 70, while that in the general population was but 6 per cent. The general death-rate was 45 per thousand, while that of the Jews was but 27 per thousand. The marriages among Jews numbered 13. In 1899 the Jewish population of Astrakhan was 1,575 in a total population of 117,772. The Jewish population in the whole government, including the city, was 1,667. In addition, there were 15 Karaites in the city, and 10 in the government ("Pamyatnaya Knizhka Astrakhanskoi Gubernii," 1900). There are two synagogues: one for the Ashkenazim, the other for the Sephardim. The rabbi of both synagogues is Boris Moisejevich Schucher. Pamyatnaya Knizhka Astrakhanskoi Gubernii, 1899, 1900.